There's good grammar, bad grammar, and then there are dialects. You all know I hate bad grammar, especially in Kijiji ads, but it might surprise you that I don't hate this ad. As Grammar Girl explains, "the truth is this: every variety of English is equally regularized and expressive—just as every language is equally expressive. They all have their own internal rules and grammar." This ad follows its own internal logic so strongly that the 'standard English' parts stand out like a herpes sore. Transcript is after the image. MY phone, not a re-buy or stolen iPhone. Eh star, you gon be gettin da actual genuine product used by only one person which is me. And lemme tell you sumtin bwoy, I done did all dat takin' care thingz u know. I been caring fo da damn phone real good. Ain't no drops or nutn like dat on dis one! Phone be in mint condition, no chips, no dent or damage or nutn like dat! Dis one of a kind phone right herre be on sale coz I done messed up my car engine and everythang niyya. I neeeeeeeeds me some moneys to fix other things. You know I gots to prioritize and fix dem thingz up. 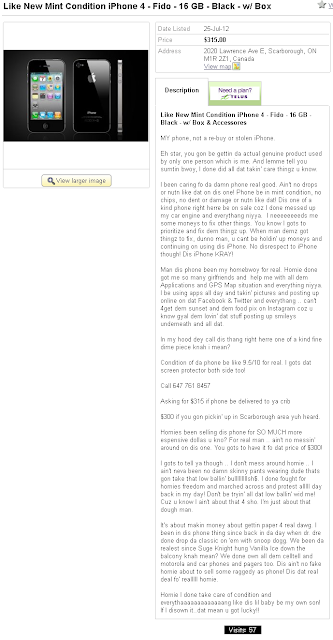 When man demz got thingz to fix, dunno man, u cant be holdin' up moneys and continuing on using dis iPhone. No disrespect to iPhone though! Dis iPhone KRAY! Man dis phone been my homebwoy for real. Homie done got me so many girlfriends and help me with all dem Applications and GPS Map situation and everything niyya. I be using apps all day and takin' pictures and posting up online on dat Facebook & Twitter and everythang .. can't 4get dem sunset and dem food pix on Instagram coz u know gyal dem lovin' dat stuff posting up smileys underneath and all dat. In my hood dey call dis thang right herre one of a kind fine dime piece knah i mean? Condition of da phone be like 9.5/10 for real. I gots dat screen protector both side too! $300 if you gon pickin' up in Scarborough area yuh heard. Homies been selling dis phone for SO MUCH more espensive dollas u kno? For real man .. ain't no messin' around on dis one. You gots to have it fo dat price of $300! I gots to tell ya though .. I don't mess around homie .. I ain't neva been no damn skinny pants wearing dude thats gon take that low ballin' bulllllllllsh$. I done fought for homies freedom and marched across and protest alllll day back in my day! Don't be tryin' all dat low ballin' wid me! Cuz u know I ain't about that 4 sho. I'm just about that dough man. It's about makin money about gettin paper 4 real dawg. I been in dis phone thing since back in da day when dr. dre done drop da classic on 'em with snoop dogg. We been da realest since Suge Knight hung Vanilla Ice down the balcony knah mean? We done own all dem celltell and motorola and car phones and pagers too. Dis ain't no fake homie about to sell some raggedy as phone! Dis dat real deal fo' realllll homie. Homie I done take care of condition and everythaaaaaaaaaaaaang like dis lil baby be my own son! If I disown it..dat mean u got lucky! !